Dooster is a powerful new task and project management app that will help you get better organized and save time and effort – whether you’re working alone or with others. It’s very easy to use. Your Dashboard: shows you “all your stuff in one place”. You can quickly see the status of your tasks / projects and what each member of your team is currently working on. Quickly sort / arrange your tasks into your preferred order by clicking on the column headings. Filters are a powerful way to narrow down what you want to see. You can use them on many screens such as your dashboard and task lists. 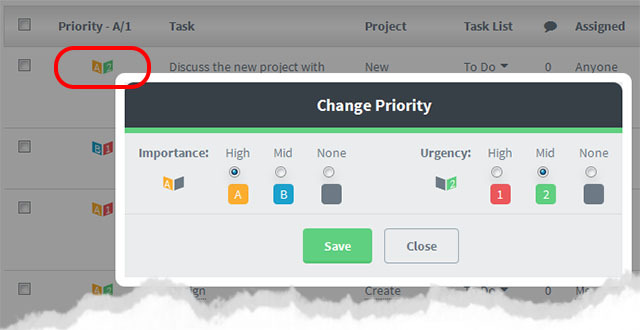 Filter by factors such as assigned to, due dates priority projects and more. Combine filtering to achieve very precise overviews of exactly what is going on. Use the short cuts in the overviews to edit tasks without opening them. For example by changing it’s priority – see example below. (The Pop up is revealed when the icon is clicked on – using left-click. There are right click shortcuts aswell – see below). This also works for Due Date, project location (ie to quickly move a task to another project) and others. Use Right click on any task to open up an instant mini control panel that lets you alter the task in a number of ways. Each project has its dedicated section. 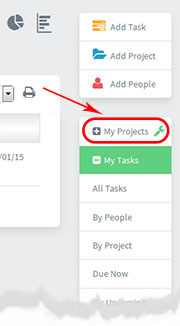 Use the “My Project” links on the right side navigation to drill down into each project. Now you can see the associated tasks, calendar, files and overview of tasks relevant to each project. Collaborate with people the easy way. As a Dooster Account Owner you can invite people to work with you in your account as “**Team Members**” and set them access permissions – which can vary project by project and can be changed at any time. You can also share projects with other Dooster Account Owners (read on) while both keeping your other stuff private. Tip: You can add any type of Dooster user on the fly while creating tasks. Plus you can remove them at any time. You can also see the “Dooster Tour” – open your account (or easily create a new one) and open Account Settings / Welcome / Set up tab.